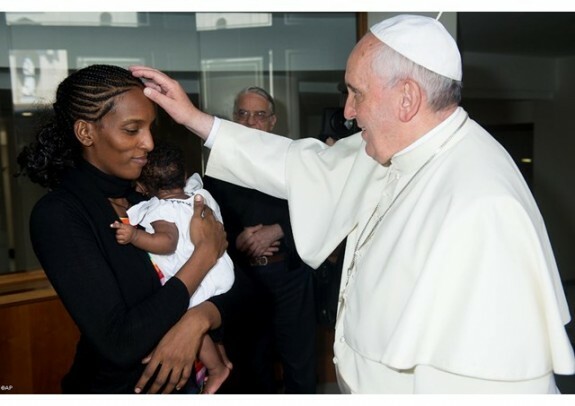 “Pope Francis was very tender with her, her husband, who was in prison, and thanked her for her courageous witness to perseverance in the Faith,” Vatican spokesman Fr. Federico Lombardi said of the encounter in a July 24 statement. After having her death sentence revoked by a Sudanese court June 23 due to international pressure, Ibrahim was re-arrested along with her husband at the Khartoum airport the next day on charges of forged documents. The entire family was detained for two days, until the new charges were dismissed. Italian news agency Corriere della Sera reported that the family has remained in the Italian embassy of the Sudanese capitol, Khartoum, since June 26 until leaving the country on a flight that landed in Rome this morning at roughly 9:30 local time. On board the flight along with the family was Italy’s vice minister of Foreign Affairs Lapo Pistelli, who has been following Ibrahim’s case. According to the agency, Pistelli had already met Ibrahim in Khartoum July 3. The family is set to remain in Rome for a few days, after which they will depart for New York.